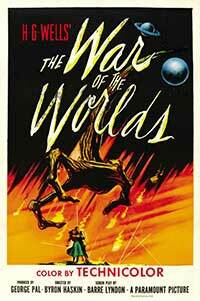 The War of the Worlds is based on the sci-fi novel by H.G. Wells and tells the story of small village in California that is struck by a what they believe to be a comet, beginning an alien invasion that shortly spreads around the world. At the start the residents are enthusiastic thinking of the comet as a way to enhance their tourism, but the soon realize they are under attack by malevolent Martians. The movie gets quickly to the point, which is the realization that the comet is related to an alien threat, as the Martians find it difficult to live on their planet anymore, thus seeking for another one, which has friendlier living conditions. Early on, The War of the Worlds is focused on the efforts the locals make to show the Martians that they are friendly towards them and then shifts to the residents trying to defend themselves. Gradually the aliens attack other cities and European countries, with many of the facilities being unavailable, because of the radiation the aliens produce. So the movie then focuses on international coordination with the goal of eliminating the Martian creatures that threaten their existence. It confused me a bit which devices were working and which were not, because in the beginning it is said that radiation caused a general blackout, but later we see the locals listening to news on the radio, which I found contradictory. I also think it would have been better if we saw the Martians’ point of view too and sometimes I had this feeling that the script did not have many things to say or the characters were a little shallow. However, I can understand the value of the film as an interesting starting point of further contemporary movies that had to do with alien attacks on Earth. • Dr Clayton Forrester (Gene Barry) who happens to see the comet while he is fishing. He is a well-known scientist and takes over the case. Acting both from the three protagonists and the rest of the cast was very good, with them persuading us about the emergency of the situation. By the way, I enjoyed the chemistry between Gene Barry and Ann Robinson. However, the problem is that maybe because of the concept of an imminent threat, there is no focus or any depth given to any of those characters in terms of personality, which is something I expected to see. In my opionion, the film was excellent from a visual aspect. Although Byron Haskin’s direction did not really fascinate me, I have to praise the vintage style of the film, which differentiates it from the new versions, although this is, granted, more a product of the era. I was also impressed by the appearance of the Martian creatures, which was something I did not expect at all. Cinematography was not as stunning as I expected it to be, though the visual effects used were really spectacular — specifically those used during the fight sequences. The end seems logical, but I was surprised and frustrated by it. I also did not like the religious connotations. 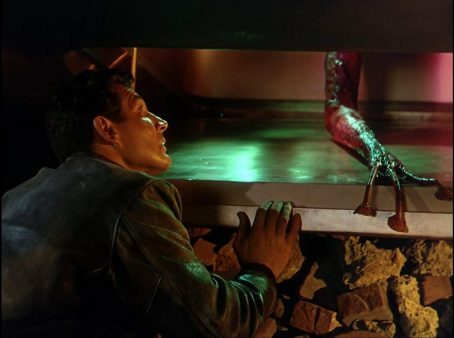 A small village in California becomes the epicenter of a global alien invasion in this 1950s sci-fi classic based on the H.G. Wells novel.